We're displaying "box only" and "manual only" prices for games. Mobile and desktop users will be able to see these prices while browsing a game page (like this one for Super Mario 64). Like all the other conditions, you can see the sales history for box only and manual only by clicking their tab. For some games like Stunt Racer for Nintendo 64, the instruction manual is actually worth more than the game....Stunt Racer was a Blockbuster exclusive so most of the manuals were destroyed by renters long ago, which makes the manual and box very hard to find. Wow, this is great! Wondering if the manuals are going to be added to the collection totals also? 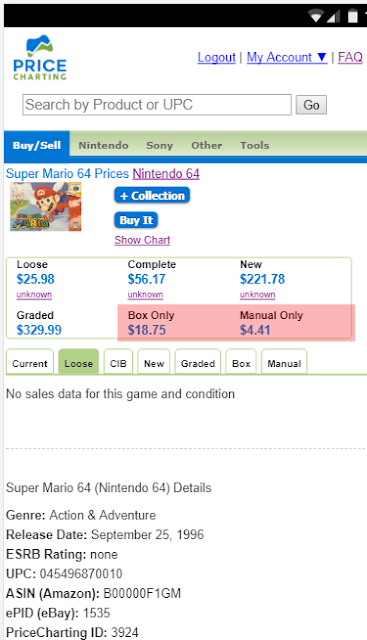 For example if you have a game and a manual but not CIB will the value of the manual only be reflected in the total? @unknown - Manuals are not added to the collection totals yet, but we plan on adding that in the near future. We plan on adding values for manual by themselves and manual with a game BUT not CIB. Same with boxes. We will post to the blog when that is live. This is awesome I just joined the site about three days ago when I purchased animal crossing CIB memory card included! I'm looking to become a seller now that I know this is legit website,but I was curious can I get a better name? Instead of the bot sounding untrustworthy name of wyktyc3 or something like that Lol. Can I change it after I make some successful transactions with customers or before hand? I think it would help my sales tremendously if I could change to my nickname which is JJ as well,coincidentally. Thank you for your time! Will you guys ever track UMD video prices? @jhauer29 - We don't have any immediate plans to add UMD movies but we definitely could. You can vote on this feature on our feature request tool. We use this to help us prioritize features that users want us to add.